The next installment in the large block Abstraction series is here, introducing the Giraffe! You may have seen her at International Quilt Market in the Fall. The Lion, though mighty needed a graceful friend to keep him company. The Giraffe features a bright color saturated palette of Cotton Couture fabrics by Michael Miller. The Giraffe is foundation paper pieced and is made with one striking large scale block. The Giraffe finishes at 44" x 60". Below you will see the color chart for The Giraffe quilt. Each one of my foundation paper pieced patterns features a color chart with all the colors organized from dark to light. In this pattern, The Giraffe colors are on the left and the background colors are on the right. You can now purchase The Giraffe in my PDF shop. Today was a day of epic technical difficulty proportions. With my cute pink laptop that is WAY cuter than functional at this point in her life ... I won the battle over bad print drivers, insufficient memory and just plain ancient software to bring you this new pattern that I am ridiculously excited about. You can now purchase The Lion in my PDF shop or pre-order paper patterns for your store in our Wholesale ordering section. If you need a wholesale account, please email us at violet@violetcraft.com and Whitney or I will get you all settled in! Brace yourselves. The Lion templates are a whopping 35 pages of 11" x 17" paper piecing goodness. He is SO MUCH FUN to make. I'm starting on my second one this week. Forest Abstractions: The Pinecone is also now available as a FREE download in the shop. We are so close to wrapping up those free blocks. The final block is around the corner! I am writing you from Spring International Quilt Market in Minneapolis, Minnesota where I am debuting the first project in a new series, Jungle Abstractions. The Lion is a foundation paper piece quilt made with one striking large scale block. Finished measurement is 60" x 60". The PDF pattern will be available June 1. NOTE FOR SHOPS: Shops can pre-order the paper pattern beginning on June 1. Patterns will ship to shops by July 1. If you pre-order before July 1 you will receive a free PDF pattern to make your shop samples ahead of time! Curriculum for teaching the pattern in your shops will also be included with your shipment in July! NOTE FOR FOREST ABSTRACTIONS QUILT-A-LONG FRIENDS: The next block is about one work day away from being posted. I plan to complete it and prep the files as soon as I am back in the studio next week... and if you have read this far, you deserve to know what's coming... The Pinecone :) He's such a cute little pinecone. I can't wait for you to see it! Thank you for hanging in there with me! The fourth block in our free six block series is The Hummingbird. This sweet little block will fit into our Forest Abstractions quilt in the top right hand position as shown in the updated layout below. Only two more surprise blocks to go! This block is FREE in my shop. You do not have to enter payment information. As long as your cart is $0 proceed to checkout, fill out the contact information and the cart will email the link to the file. Download the Templates, Piecing Order, Fabric Palettes and Diagram here. My Abstractions patterns originate from creating 3D models of real animals I have photographed. I create the patterns in such a way that the shapes of the pattern pieces combined with the placement of the fabrics distinguish skeletal and muscular structure in the animals. In the Forest Abstractions Stag notice the curvature in his back and haunches. Where the lines break out the individual shapes and combine with the fabrics to create the movement and curvature in these places. Now look to the facial structure and the long snout area and the contrast created by the area for set back eyes. In his legs the lighter fabrics and long lines of the pieces highlight the long sinewy shape of the legs. Each fabric was chosen to highlight or lowlight the appropriate places to capture this movement and curvature while still retaining the abstract sharpness of the design. To retain the same look in your blocks you can use the exact or similar prints as I used or you can select your own and follow a few simple guidelines. Let's take a closer look at the fabric chart included in all of my foundation paper pieced patterns and how it can help. The example below left is for the original Stag block from the cover quilt. The fabrics are listed on the chart with the background fabric first and then all other fabrics follow from dark to light. To retain a similar look select fabrics and arrange them in the same order with background fabric first and then from dark to light. An alternate "Bright Palette" chart is shown below right using this method. When I was placing the fabrics on the chart, I wasn't exactly sure which order they should go in. To make sure I had them in the correct positions I took a photo of them and then also used a filter to make the photo gray scale and then it became more obvious. It is very important that the background fabric you choose contrasts well from all other fabrics that will touch it. In the example of the Forest Abstractions Stag, all other fabrics will touch the background fabric so I chose the Cotton Couture deep Eggplant in the original quilt which contrasts well with all of the other prints. In the Bright Palette I used all very saturated prints, so the lighter linen-blend background contrasts well with all other prints. In this version I created a rustic Christmas Stag. I reversed the lights and darks which still highlight the appropriate places and results in the chart shown below. For the background I chose a deep red to contrast with all of my other choices. I also created this Forest Abstractions Stag head pillow in lighter prints where the lights and darks are reversed from the original. I chose the very light Rosemilk in White as the background. So, let's say you want to do a completely scrappy version, but still maintain the same contrast in these areas. Gather your scraps and then organize them into piles from high saturation to low saturation. When the pattern calls for one of the darker fabrics, select from your high saturation pile and so on and so forth through to the lightest fabrics. Again, choose a background that will contrast well with all of the scraps you have chosen to use. So, you want to know more... let's get picky. When looking at any of the blocks, look to the original cover quilt and think about which pieces are important to you. For the Stag, my starting point would be his face. That long, strong snout is a standout piece in the pattern. The face really sets the attitude of your entire Stag. This is the fabric I would choose first. Once you have determined this piece, you can really choose which of the above routes you want to go down for the rest of your selections. In the original Stag I chose Timber Valley in Fog. Although my other fabrics are all a little sweeter than this fabric, the moodiness of the Fog print really sets the attitude of the Stag. The sweet peach and coral prints don't take on the softness they would if his face weren't set as such a strong focal point. Looking to the chart, I found that the face was second to top position under the background and the hoof fabric making it almost the darkest print on the chart. This coincides with the fabric I chose, so I went down the chart from darkest to lightest from there. Now, let's look at the Stag Pillow. I chose the sweet Rosemilk print to create a more romantic attitude for the pillow. Because this print is the lightest I wanted to use, I reversed the order of prints so that they fell lightest to darkest on my chart. Once you start to look at positioning you can really customize your look and see if it makes sense before you even begin. You can see that the chart shows where the hooves are and that the hoof fabric is not used anywhere else and choose accordingly. You can see the lightest fabric on the chart is the setback for the eye position. Does the fabric you chose for this position on your chart make sense in this part of your Stag? If not, you can change it up before you start. I hope all these tips are helpful. Show me those blocks on Instagram and remember to hashtag #forestabstractionsqal. I disappeared off the face of the blog for awhile. If you follow me on Facebook or Instagram, then you probably have a better picture of what in the world we have been up to. The Craft Family unexpectedly bought a house and moved our home and studio and four people and four fur babies across the river right back in time to 1969. Well, our home and neighborhood feel like we moved right back there anyway. I am in love with this house. We did this right smack in the middle of the holidays and upended any grand plans of staying on schedule. Our girls started new schools and the oldest is attending a true middle school for the first time... and in the middle of the school year. Transition has gone really well, but it's still been, well, transition. And it's certainly not over. We are all settled into our new home though. The beautiful Janome longarm I received right as we were making an offer on our new house is STILL IN ITS BOX. Oh my goodness, if I didn't have so much to get us all back on track with the quilt-along, I would go unpack that baby right now... but I'll worry about that when we are done with this quilt, alright? Alright! So.. on to the Stag! Stag instructions post coming Monday with the next surprise block right on its heels next week. Thanks for hanging in there with me! I have so many fun projects and fabrics launching this year and I can't wait to share them with you. More "Abstractions" are coming as well as more free projects and blocks. Two years ago I had the honor of having my fabric collection, Madrona Road, featured in The Modern Quilt Guild's fabric challenge. Through that challenge I was humbled and heart warmed repeatedly. I discovered and befriended so many amazing quilters though the projects made with Madrona Road. One such quilter is Casey York. Her challenge entry, Onwards, is a personal favorite of mine. I chose Casey's quilt as one of my top two for so many reasons: her use of bold color, the depth of perception in the quilt, the dramatic impact of simple forms and the quilting to further the experience of the perspective. I was then fortunate enough to meet Casey in person at Quiltcon in 2013 where I discovered her quilt, Apiary. Apiary again grabbed me for it's color and shape, but this time I could see the level of detail in the finishing. Every appliquéd shape is embroidered impeccably with Casey's technique for hand-embroidered raw-edge appliqué. Casey's new book, Modern Appliqué Illusions, presents 12 brand new projects. Casey speaks to her inspiration for this series of quilts and gives step by step instructions on how to create an illusion of your own complete with embroidery finishing. Casey is so generously giving away a hard copy of her book on EACH of the locations on the blog tour listed below. Visit Casey's own blog for a full tour of the book and projects. 11/18: Krista Robbins/Sew What’s Cooking? Our third addition to the Forest Abstractions Quilt is the Wild Carrot block! Wild Carrot is also commonly known as Queen Anne's Lace which was introduced from Europe. The carrots we eat today originated from this plant and the root at the bottom of the Queen Anne's Lace is actually an edible carrot although the leaves are toxic. Wild Carrot is a print in my Madrona Road collection and is the inspiration for this block. In this example I have reused my modern watercolor technique from this previous project: Watercolor Heart Block. To achieve this look, use a loose print on a solid ground and choose a background fabric that matches as closely as possible to the ground from your print. I have used the Brambleberry print from Brambleberry Ridge in Quartz paired with Michael Miller Cotton Couture in Iris. For the center flower, a distinguishing characteristic of wild carrot plants, I have used MM Cotton Couture in Eggplant and Toffee for the stem. The white leaves in the Brambleberry print serve as the individual flowers in the wild carrot bloom. Fabric guide in original color palette. In your Fabric Selection Guide you will see the Wild Carrot Block is designed to be used in a more straight forward way with two prints alternating to achieve a more abstract look. These prints are distinguished with light stripes and light dots in the guide and templates. As shown in the photo of my example guide, I have used the same Brambleberry print in both sections. Next week I will show an additional sample block, not in the watercolor style, with two prints used. This block is FREE in my shop. You do not have to enter payment information. As long as your cart is $0 just proceed to checkout and the cart will email the link to the file. Download the Templates, Piecing Order, Fabric Palettes and Diagram here. "How are you going to fix the wing? Will you have to re sew all the seams in sequence that follow the wing fix? Is there a good way to go back in and fix one segment in the middle of the block if you don't see the error until all the pieces numbered after the error are sewn? I finished the doe and then saw that I left a hole in one of the hoofs where the fabric wasn't big enough to fully cover the section. All the seams around it are sewn and look fine. Thank you." Let's start with my wing fix and then I'll specifically point out what my plan would be to fix Katie's little problem with her Doe. Here's our broken wing. You can see where piece D4 was just completely missed, which left the brown fabric from D1 left there making the wing look like it's sticking out below where it should be. I gathered my tools: seam ripper, small scissors and the replacement piece of fabric. Looking at the pieces, I found the path of least resistance to get to the piece that needed to go in. I seam ripped the G section on the right away from the CDEF group on the left, only about 1/2" past the next seam I need to take out. I then ripped the seam that connects the CD group from the EF group, again only about 1/2" past the seam I need to fix. The final seam ripping separated C and D, again just about 1/2" from where I need to sew the missed piece on, fully exposing the area we need to sew on the new piece. Fold back any pieces that are in your way and secure them with pins. Place the new piece of fabric in the same way you would if you were just getting to this step for the first time. Sew the seam and trim the allowance, then press forward as normal. Trim the outside edge seam allowances. Now re-sew the groups back together, starting with re-sewing section C to section D. Next, re-sew the section connecting CD to EF. Finally, re-sew CDEF to G.
Complete! Total time was about 30 minutes to fix and well worth it. Below we can see Katie's litte doe hoof is missing a tiny corner. From another photo I found I know that this is the farthest right hoof. I would begin by ripping the horizontal seam from the right side of the block to at least 1/2" past the last seam we need to work with as pointed out by the white arrow below. Next, I would rip the seams on the right and left side of the leg to at least 1/2" above the hoof seam. Third, remove the small background piece under the hoof. Finally, remove the hoof fabric that doesn't fit. The final steps would be to replace the hoof fabric with a piece that fits, re-sew the background piece on, re-sew the seams on the right and left of the leg and finally re-sew the horizontal piece under the hoof. I hope this is helpful information. Good luck and happy sewing! Moving right along with another Falcon. Have you looked at the Instagram posts or posted your blocks to the #forestabstractionsqal hashtag? We'd all love to see them! If you currently have a Broken Herringbone pattern, please check the BACK COVER. The Sashing Fabric section should match all of the interior instructions and read : 1 yard white solid fabric, divided into (20) 1 1/2" strips. MOST of them say this. Somehow between printings I changed the back cover to read 2 1/2" strips. I have NO IDEA how I did this, but alas, it was definitely me who did it. If you have one of these copies of this pattern, please change this on the back cover of your pattern. All information on the inside of the pattern is correct. I apologize for any problems this might have caused! Falcon, with one background piece missing and in the wrong background color. Mistakes happen! If you are looking closely you might notice a couple of issues with this Falcon. I had someone help me out and make the block. Without a color chart, a couple things went awry. I am traveling for the next week so since I don't have time to fix it right now, I had planned to Photoshop them out and make it all perfect-like for you... then I realized that's just plain silly. I make mistakes. We all make mistakes. I always say that your seam ripper is as important of a tool as your sewing machine when paper-piecing and here is a perfect example. Also - if this happened here, it could most certainly happen to you too, so let's figure this out! First of all, there is a background piece missing in the left wing. See that brown part that is sticking out, it's not supposed to be there. I'll be pulling that wing apart to fix that. Second, the background color is the wrong one and so is the brown used in the wings. If you are using a kit or the fabrics used in the original quilt, you might run into this same problem. Below is the chart for the Falcon in the original layout with the Cotton Couture color card. There are three light purple/pink colors of Cotton Couture in the quilt and one dark. If your solids are not marked with the color name, you should be able to use the chart below to figure out which one is which. Iris is the lightest and is used as the background in the Falcon block. Primrose is the middle shade and is what was accidentally used in the block below. Mauve is the darker of the three fabrics. Eggplant is also a purple in the quilt and is the deep background for the stag block. Iris, Primrose, Mauve and Eggplant, oh my! The browns contained in the original quilt are Taupe and Toffee. Taupe is shown below and is a rich, but lighter muddy brown. Taupe is the correct color used in the original quilt. Toffee has a golden hue and is used in the block above, but is NOT the correct color. That said, I won't be "fixing" these colors. I think they look great together and I also think I will still have enough left of the solid fabrics to complete the rest of the quilt as expected. It's possible I even like them more as it softens the look of the Falcon a bit. I'm undecided how I will feel about the overall color change with the rest of the blocks. We shall see! I find the Falcon to be a fun block to put together. Each of the sections are pretty quick and it pops together pretty fast. I'm in the middle of the mint/yellow version and will post it next week. P.S. Individual block PDFs coming next week! FAQAL Surprise Block #2: Trillium! Hello again, Friends of the Forest! Trillium is one of my absolute favorite native plants. I discovered it when I moved to the Pacific Northwest. It is a lover of shade and has the most beautiful foliage. I hope you like it! This block is FREE. If you download it from my shop you do not have to enter your payment information as long as your balance is $0. Just proceed to checkout and the cart will email you the file. The FAQAL: First Surprise Block! The Field Mouse! Hello Quilt Along friends! With all due apologies, let's get this party back on track! My husband is amazing and swept me and our girls away on a two plus week camping adventure that found us rafting the North Umpqua River, sleeping in a different campground every night (except the two night stop at the Michael Miller design studio!!! ), eating and drinking at one new brewery every day, taking photos at every tourist trap between Portland and San Francisco and back again and just two and a half weeks of all around family style nonsense. It was fabulous and we love him to pieces and I will post vacation pics soon too... but now, back to the Forest Abstractions Quilt Along! Everything should get back on schedule this month. I will be posting more Bunny examples including the original from the Brambleberry Ridge kit and my Christmas version!!! Field Mouse examples will be added this weekend and then I'll get the Falcon up ASAP. Whew! We are going to be busy. Yay! Now, let's make a Field Mouse! Download the Templates, Fabric Palette, Piecing Order and Diagram here. Sweet yellow & mint version. He's wearing footy pajamas! Welcome to my workspace. On the left I have a 14" rotating cutting mat, an Add-A-Quarter ruler and rotary cutter. Right behind the mat is a large glass jar that I use for my trimming scraps. My sewing machine, the Janome 1600P, is set with a short stitch length to help notch the paper and strengthen the seams for easier paper pulling. Please notice my seam ripper front and center on the sewing machine. For me, the seam ripper is a main tool in foundation paper piecing. Fabric placement changes WILL happen. The seam ripper shouldn't be viewed as something you get out for mistakes - it's a part of the process and I use mine frequently to change the placement of fabrics while I work. On my left is my handy lightbox sitting on a small table. My husband made this giant beauty for me as a gift several years ago using an Instructables tutorial. My Fabric Palette is taped up above my lightbox and I have each fabric lined up in front of the Palette & Piecing Guide. Not pictured: My iron and pressing board are at my right also on a tray table, a paper bag is at my feet ready for paper scraps and my templates are all cut and lying in order with A on top of the stack. My first piece of fabric for A1 selected and ready to go. Here is my filled Fabric Palette for this block. I have chosen a fresh, light and bright palette of mint and yellow. I am using a more scrappy look and have picked more than one fabric for a few of the slots. Black: In place of black for Bunny's eye and nose, I have used the gray from the background of Waterfront Park Flight in charcoal. White dot on gray ground: I have two fabrics on my palette. These two prints, Brambleberry in Aqua and Shimmer Reflection in Mint read as a very similar color and saturation and I want to use them interchangeably as I go along. White triangles on gray space: I have a lighter mint fabric than the earlier prints, Flight in Mint. Gray dot on white: I have placed three different fabrics. These three yellows, Wild Carrot in Straw, solid straw and Reflection in Starfruit, I planned to use interchangeable throughout the block. You will see that as I went, I ended up removing Reflection in Starfruit from the block. White: In the final slot I have two solids as I wasn't sure which one I wanted to use until I got going. I chose the fog gray. First piece is always right side down, away from the template. I have taken my first piece of fabric and placed it underneath the template, under the A1 position. The template is right side up and the fabric placed under the template is right side down. Notice that the fabric piece extends at least 1/4" beyond all of the A1 edges. Since the A1 position is along the edge of the A template piece, the fabric also extends all the way out to cover the 1/4" seam allowance dotted line. This fabric piece was fitting almost perfectly... almost too perfectly. I was worried it would slip as I was sewing on the second piece, so I carefully lifted up the paper and used a small piece of double stick tape to hold it in place. I love this tape (Duck brand Easy Stick Double Stick Adhesive Roller) and I've never had any problems with it. The main reason it works so well for foundation paper piecing is that it barely sticks to the fabric. It loves to stick to the paper. It holds well enough to keep my fabric from shifting, but when it comes time to pull paper, in my experience the tape has always stayed with the paper. Take a good look at the space you are about to fill, A2. Notice the line between A1 and A2, this is your stitching line. The piece of fabric you use to fill the space needs to be large enough to cover A2 and at least a 1/4" seam allowance on all sides. Place a piece of fabric under A2 with the right side down and ensure it covers these seam allowances. Holding all the layers in place, carefully flip everything over so that the fabric is lying right side up. Focus on where the line between A1 and A2 lies. You should not be able to actually see it right now, because it is covered by the fabric. The fabrics should both be lying right sides up covering the places they will be once they are sewn down. Flip the A2 fabric back across the line between A1 and A2 so that right sides are together and there is at least 1/4" of fabric crossing the stitch line on the A2 side of the line. Again, holding all the layers in place, carefully flip everything back over so that the template is right side up and transfer the layers to your sewing machine. Place the layers under your presser foot. Put your needle in about 1/8" before the A1/A2 line. Sew along the line and beyond the 1/4" dotted seam allowance line. From here, you can see that the fabrics both extend at least 1/4" across the A1/A2 line and the seam extends through the dotted seam allowance line. With the template face up, fold back the template paper along the A1/A2 seam line. Trim off the excess fabric from the seam allowance. I use an Add-A-Quarter ruler as it makes this step quicker, but any ruler with 1/4" line will do. Smooth out the fold you made in your template. Place your template on your work surface so that the fabrics are facing up and the template is facing down and examine your work. Make sure the fabric covers the A2 space as well as extends 1/4" into all adjoining areas and extends across the 1/4" dotted seam allowance line. Using a dry iron or a seam roller, press the seam in place! So, what happens when you run into a light fabric that goes on after a dark fabric and creates a "shadow" in your seam allowance? Most people will probably not even notice this. I'm not convinced that I would notice it after the project was completed, but while it's right up in my face, it bugs the heck out of me. My solution is ever-so-slightly trim back the dark seam allowance. Shadow in my seam allowance. With the template lying on the work surface, fold back the light seam allowance and the template and hold it back under your ruler so that it will not be trimmed. Place your ruler so that about 1/16" of an inch of the dark seam allowance is sticking out and trim it away. This pattern has a LOT of them... okay, mostly ALL of them. Let's take a look at one. In this example I have pieced D1 through D4 and am trying to fit the white fabric D5 triangle shaped piece. 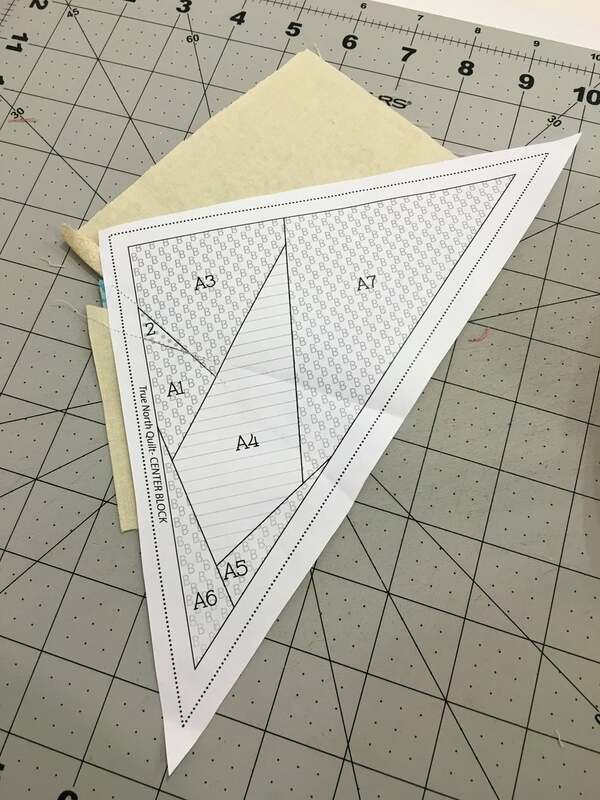 The D5 triangle does not have a 90 degree corner angle, which is going to make your fabric shift in an odd direction when you sew it on and press it in place. Here is how to get a perfect flip in the expected direction. With the template face up on your work surface, place the fabric piece on top of your template where you want it to be positioned after it is sewn, ensuring all seam allowances are covered. You can see that my fabric fits well on the top of the D5 triangle space, but has some weird jagged edges on the bottom edge by the seam. Place your ruler so that the flat edge extends 1/4" across the seam line with a little extra room. Using a chalk pencil or other marking tool, mark the seam allowance line where you will trim away the excess fabric. Place the fabric on your cutting mat and trim. Now you have the correct angle on your fabric and it should align when sewn on. With all of the angles in this pattern, it is sometimes difficult to see exactly where the end points should match to get perfect alignment. As you complete each template use the piecing guide to lay them out on your work surface with fabric right side up. When you are ready to sew two template pieces together, align them along the seam with fabric right sides together. Take a pin and put it through the top seam end point. Poke the pin through until it goes perfectly through the bottom template seam end point. Transfer to your sewing machine and secure the pieces under your presser foot. Remove the pin and sew the seam. More posts coming with the original and alternate pallets for the bunny. Please let me know in the comments if you have any questions or where you would like to see more information or detail. If you know of another store carrying kits, please let us know in the comments below! We are getting so close to BUNNY TIME! See you very soon, right here! I am so pleased to introduce you to my little foundation paper-pieced friends. The Forest Abstractions Quilt pattern consists of a full color booklet with fabric selection guide, fabric palette and piecing order for six different blocks as well as a hefty set of 20 ledger sized pages of templates for The Falcon Block, The Bunny Block, The Squirrel Block, The Coyote Block, The Doe & Bird Block, and The Stag Block. Beginning August 1, I will host a Quilt-Along right here on my blog with tips and tricks for each block and step by step instructions on how to foundation paper-piece. There are also six little surprise blocks that I will be giving away to add to your quilt if you choose to. These will be hosted here and at a few fun, surprise places to be announced along our Quilt-Along journey. The paper pattern and Brambleberry Ridge fabric and kits are available from many of your favorite online and local quilt shops. The PDF is now available in my PDF shop. So gather up your supplies and I'll meet you right back here very soon! My precut Brambleberry Ridge kit available at several online shops and my supplies, all ready to go! A little note about light boxes... they are great. I have it on my suggested list as they make paper piecing so much easier, but they aren't entirely necessary. Any bright light source will do the same thing, just not quite as easily, including holding the pieces up in the air in front of any light. My awesome husband made my large lightbox for me as a gift a few years ago using a tutorial he found online. When I travel however, I use a little light box that came in a $20 fashion drawing set my daughter received as a gift when she was about 6. It is smaller, but just as effective. I have also seen some ingenious ways to lay rope lighting inside of a plastic tub for a similar effect. Brambleberry Ridge is my newest collection with Michael Miller fabrics. It has begun shipping to stores and is now available in many online and brick and mortar shops. Brambleberry Ridge evolved from a love of my great-grandmother Adeline's 1950's home in Dodge City, Kansas and my own current 1950's home on a little tucked away, hidden gem of a ridge line in the middle of the city of Portland, Oregon where coyotes, squirrels, rabbits and falcons are often present amid the blackberry bushes and trees. The Bridgetown Dress in Rosemilk. Pattern available August 2014. Taking my great-grandmother's love of Rosemilk hand lotion, my love of her gloriously shiny costume jewelry and combining that with gold rimmed wine glasses and snack plate sets from the cupboards, a little mid-century gold gilt wallpaper, mirrored wall tiles, wood paneling and the always present hand tatted doilies on every wood surface from my various childhood homes, I wove all of this inspiration into a sophisticated, yet rustic collection of quilting cottons. All in all, this collection comes from my love and appreciation of the delicate sophistication of that era and brings it full circle into a modern collection brimming with joy. Mrs. Catterson working in the studio. New paper patterns to coordinate with the collection are shipping to stores this week and will be available as PDF downloads July 15th. To see the full collection, visit the Design Gallery.